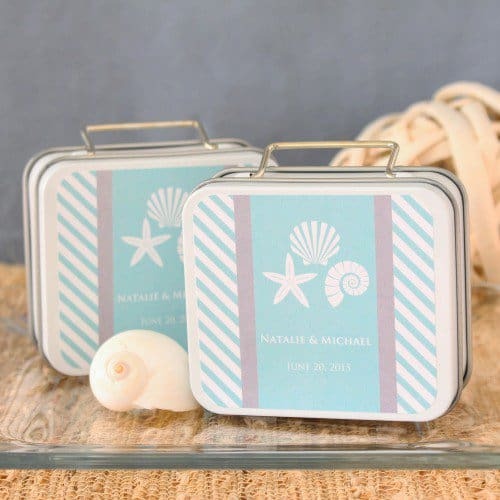 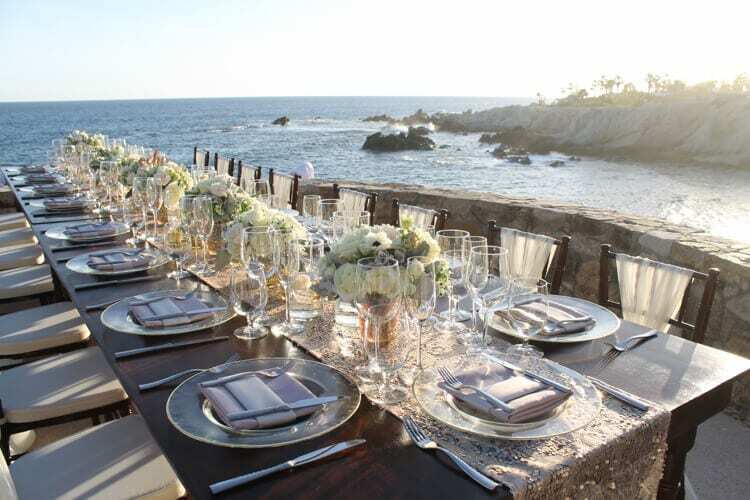 Destination Wedding welcome bags and favors are a great way to show your appreciation to those who have traveled the distance and spent a considerable amount of cash to attend your big day. 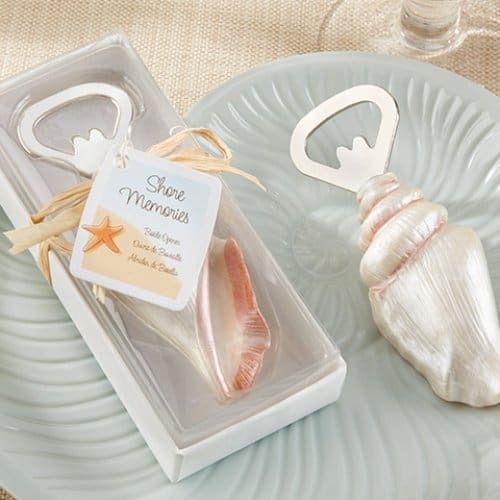 But all too often, wedding favors just get dumped in the trash or left behind. 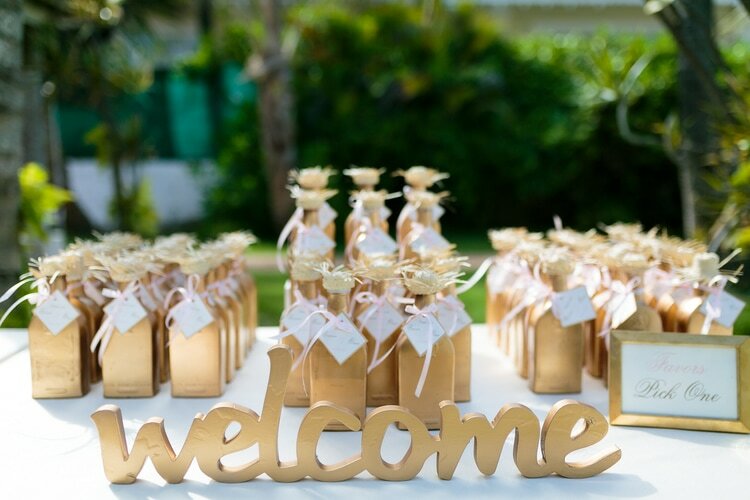 That’s why a few months ago, I asked hundreds of former destination brides to tell me about the wedding welcome bags and destination wedding favors their guests loved, as well as the misses. 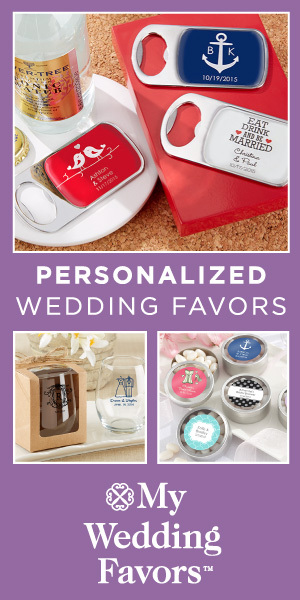 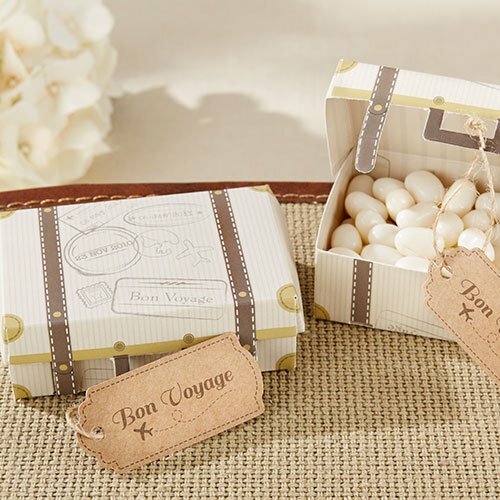 So without further ado, below is a list of the best destination wedding favors according to the destination brides I polled. 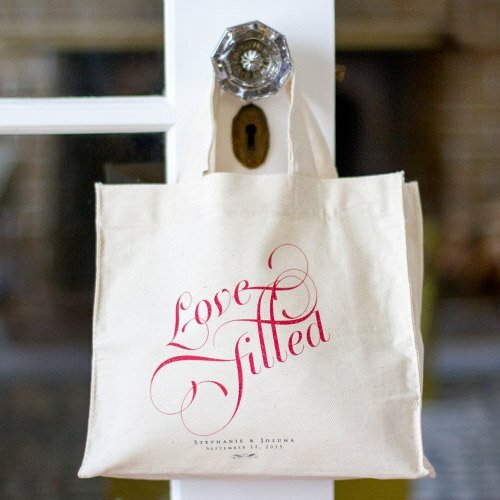 Wedding bags are probably the most popular destination wedding gifts for guests, and with good reason. 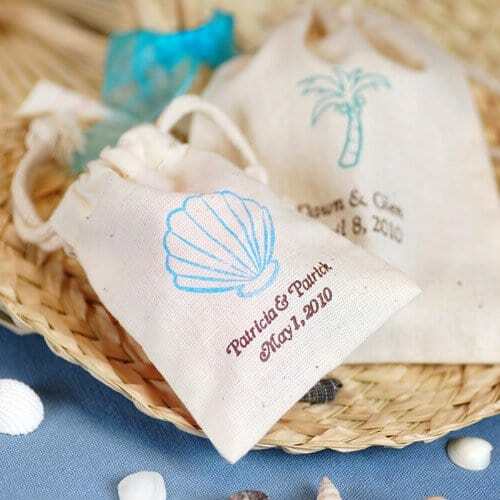 Not only are beach bags a practical gift that your guests will put to good use during the trip (and future travel), but you can also fill them up with some fun destination wedding favors. 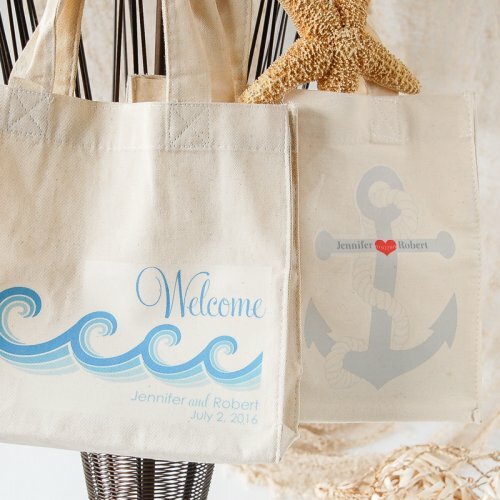 Zazzle has a ton of cheap wedding welcome bags, like the ones pictured below which are priced at less than $10 each. 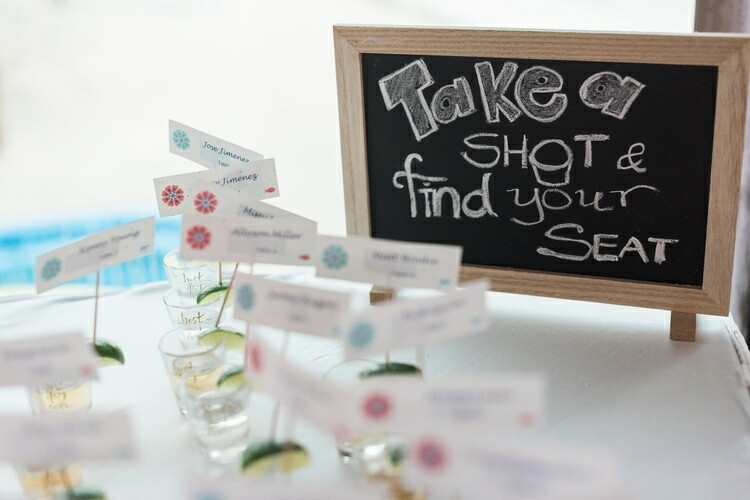 What I love is how easy it is for you to personalize their existing designs with your wedding details. 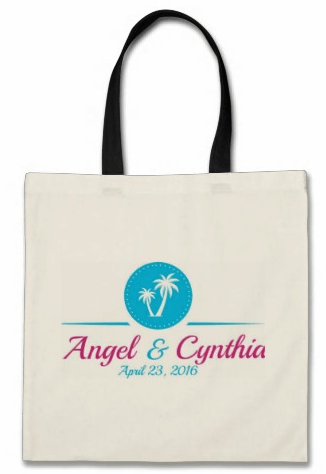 If you already designed your own custom monogram, you can upload it to Zazzle and create a completely customized destination wedding welcome bag like the one I designed below. 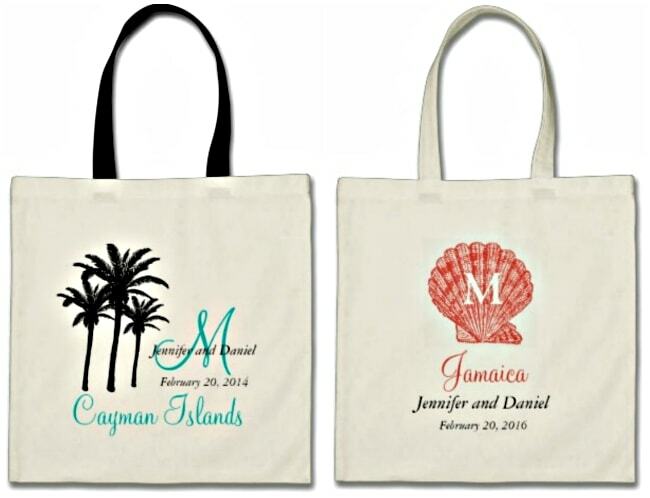 Below are a couple of other really cool and cheap destination wedding welcome bags I found (click the image for more details). 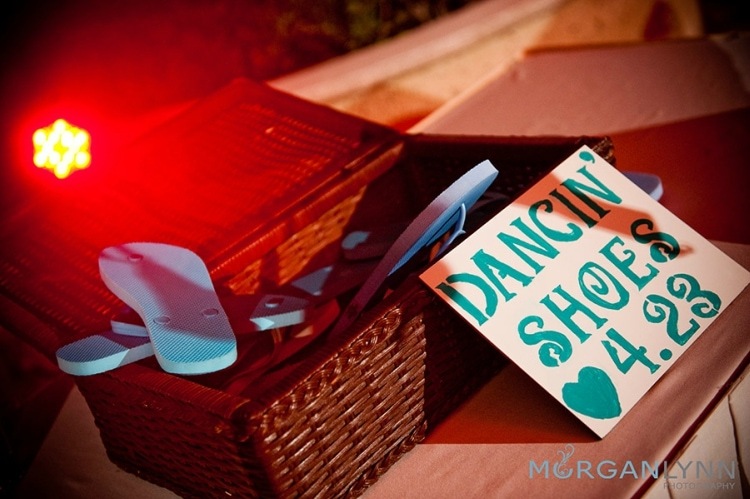 I gave flip-flops as wedding gifts for guests who attended my destination wedding, and I can personally attest to the fact that they were a huge hit. 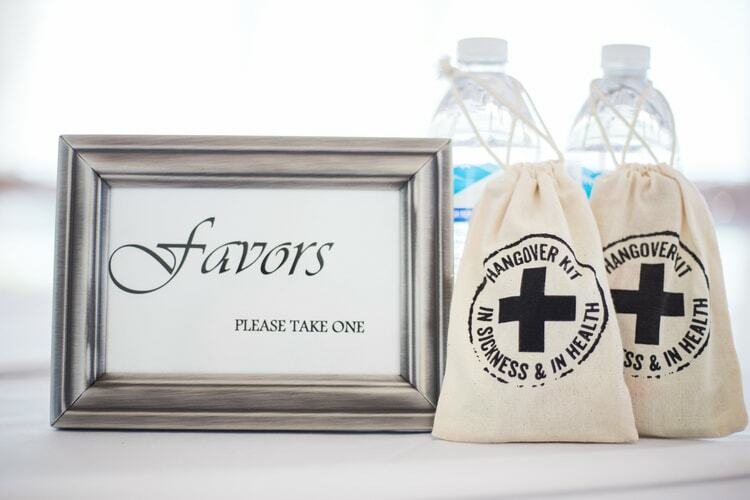 Hand these out at the reception and your guests will have absolutely no excuse for not hitting the dance floor. 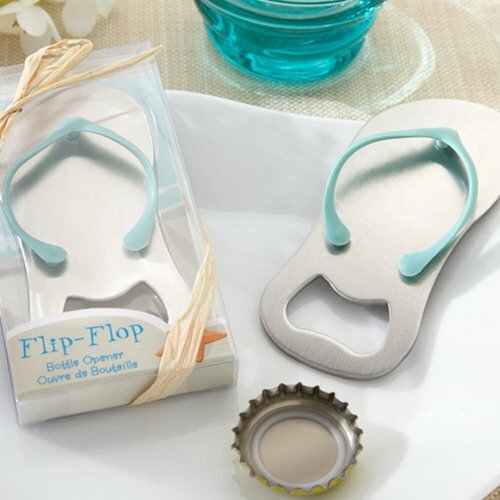 You can buy flip flops in every color and size imaginable at Old Navy for less than $3 each, which is a steal. 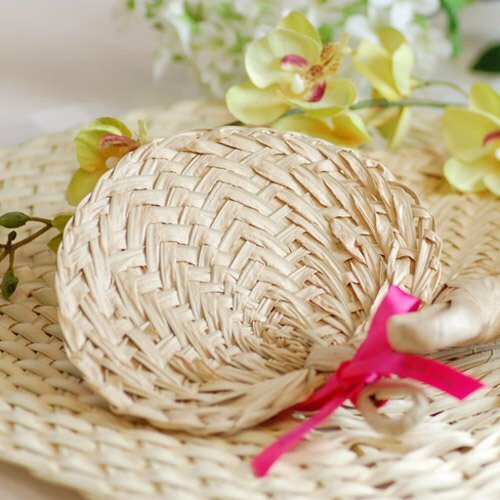 And if you can find a coupon online or buy these in the winter months, you can get them for even less. 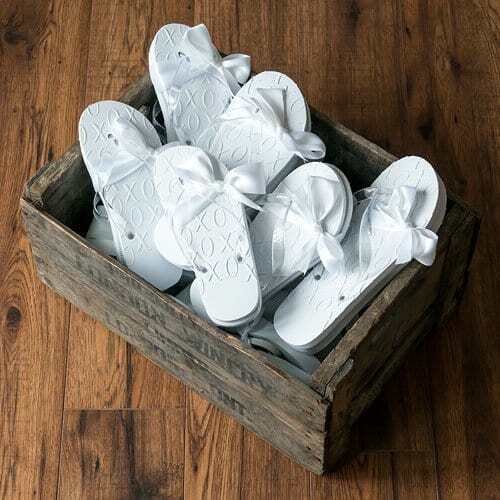 I also really love the cute XO embossed flip-flops pictured below. 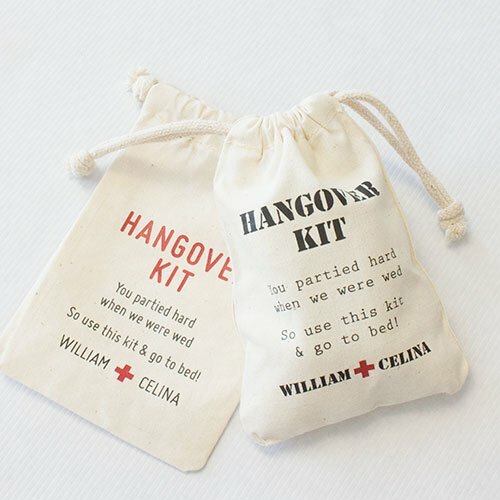 Mini liquor bottles are a really cheap and fun destination wedding favor to throw in your wedding welcome bags. 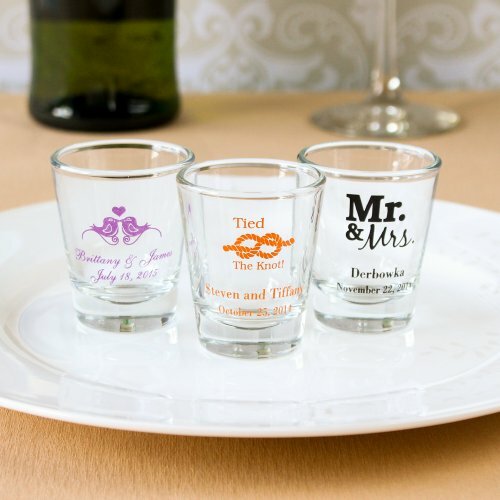 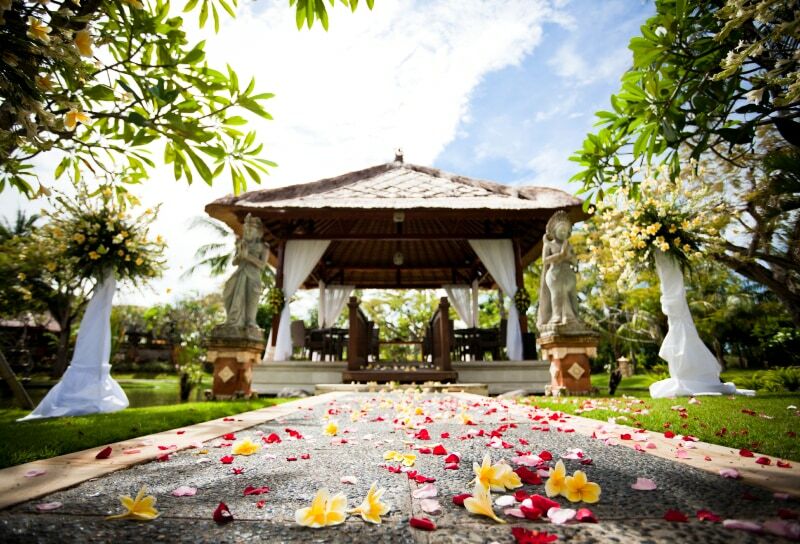 But to make it even more special, try to find the traditional liquor from your wedding destination. 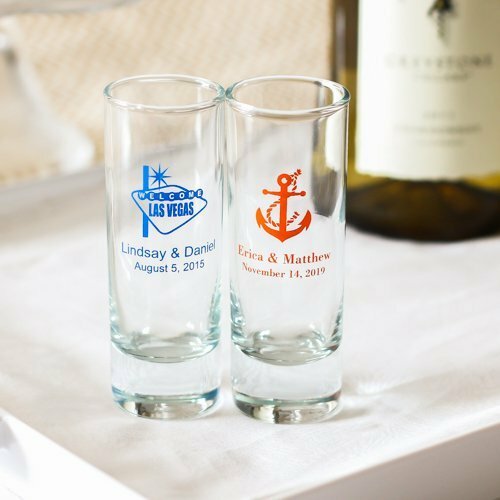 For example, mini tequila bottles are great Mexican wedding favors and mini Barcelo or Brugal bottles would be a hit for a destination wedding in the Dominican Republic. 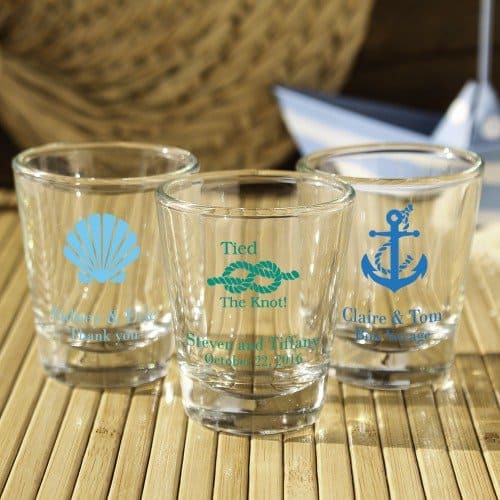 Keep in mind, that you can’t travel with liquor or mail them, so your best bet is to buy these when you arrive at your destination. 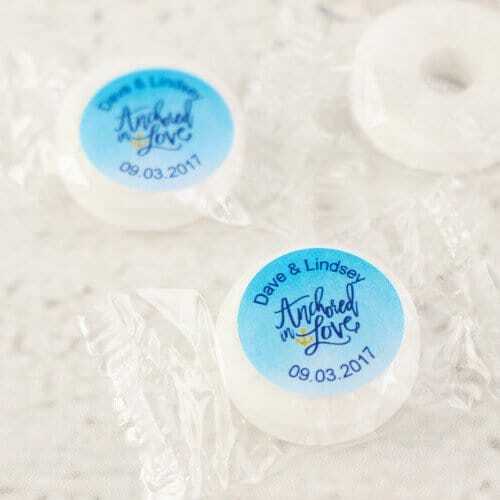 To personalize the bottles, all you have to do is order some labels or cute travel themed favor tags like the ones pictured below. 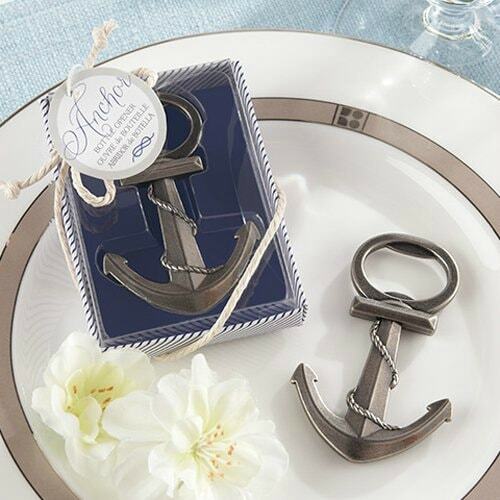 Coasters are also a favorite because they’re something guests can take home and put to good use for years to come. 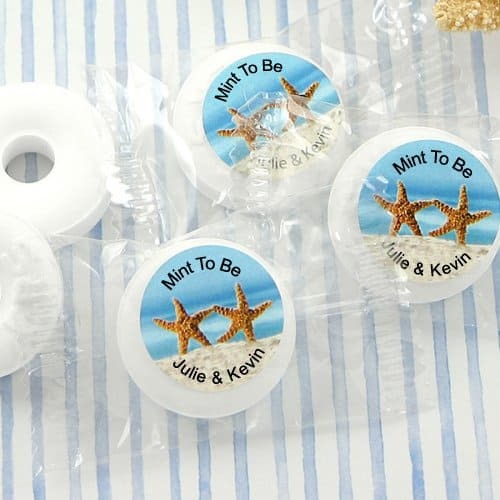 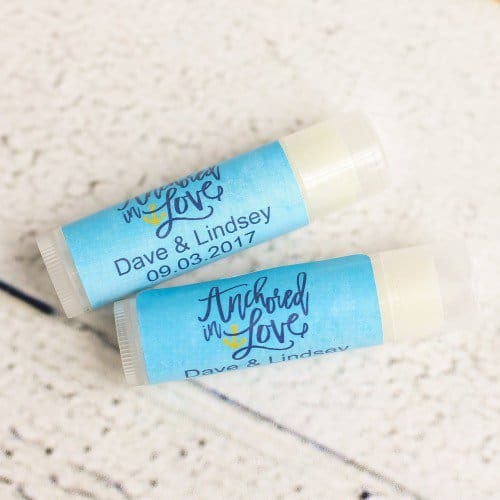 Lip balm with SPF always comes in handy, and you can add some really cute travel or beach themed labels with your name and wedding date for a personalized touch. 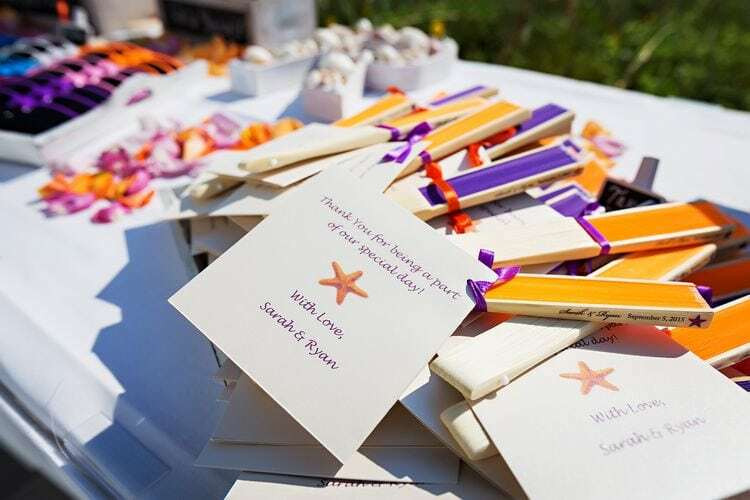 A deck of playing cards is another great favor to put in your wedding welcome bags for guests to enjoy both on the trip and back home. 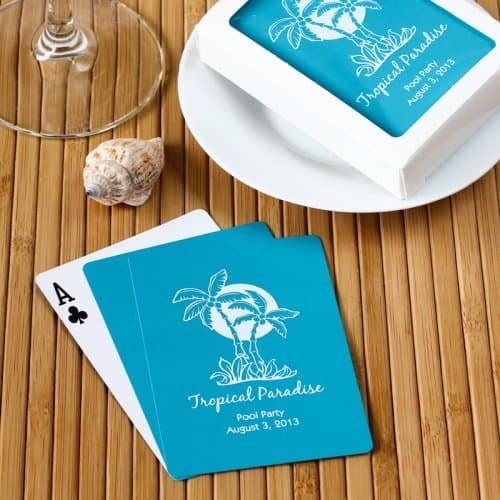 How many times have you been on vacation trying to figure out what to do with your money, credit cards, and hotel key card while you lounge poolside? 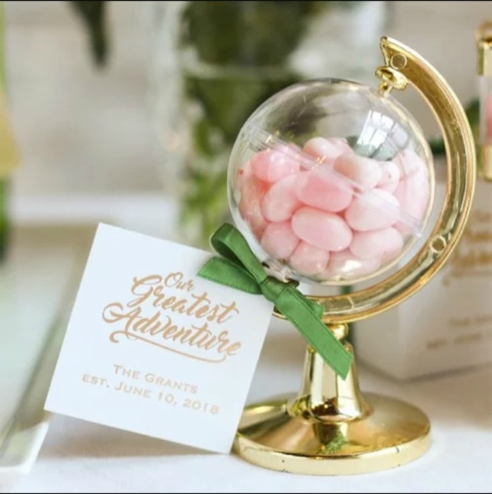 This is something your guests will never think of bringing themselves, but they’ll be super grateful you did! 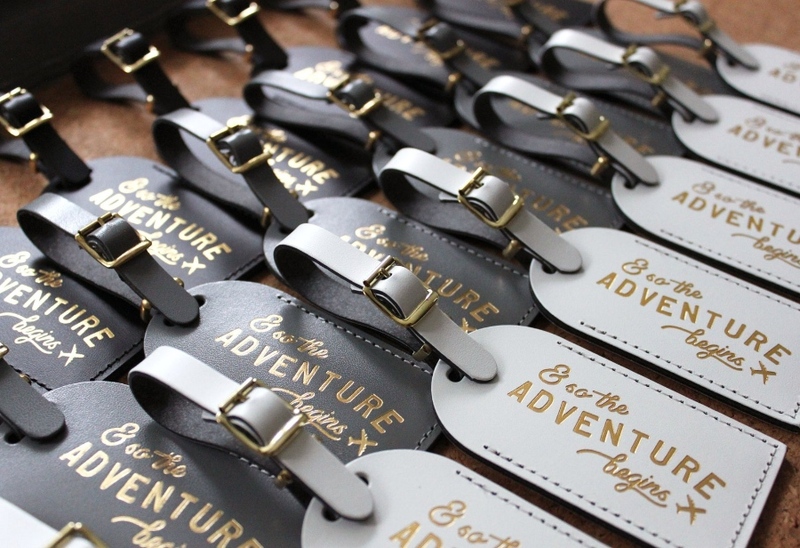 You can order waterproof key card holders and pair them with some cute personalized cards to insert in the key card holder like the ones I found below on Etsy. 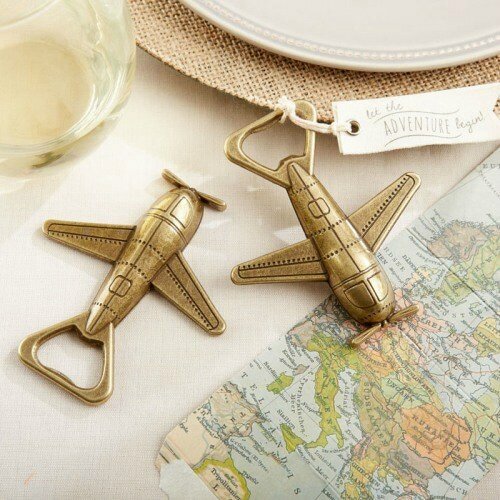 Probably the most practical of all destination wedding favors is the luggage tag. 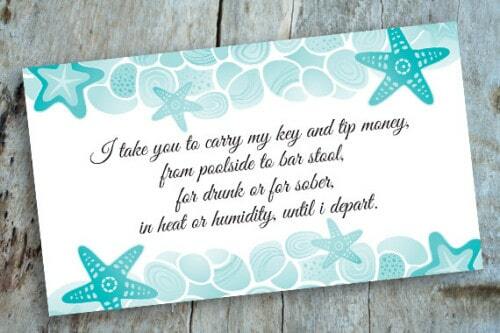 These can double as table seating cards to make them even more useful. 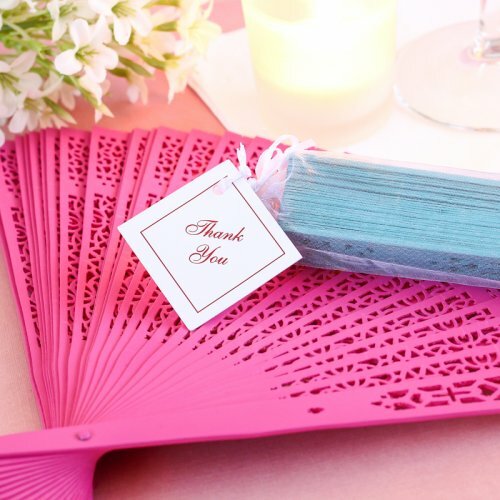 If you’re tying the knot in a tropical location, fans are a very inexpensive, cute and really useful addition to your wedding welcome bags. 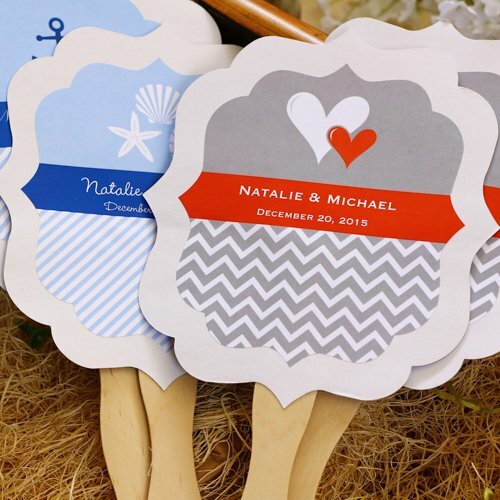 I’m kind of obsessed with fans as a destination wedding favor, so I was like a kid in a candy store when I was researching different fans for this post. 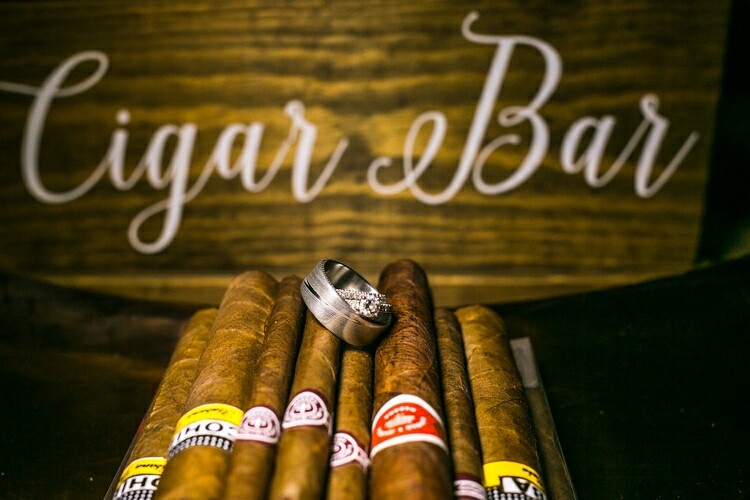 Here are my favorites. 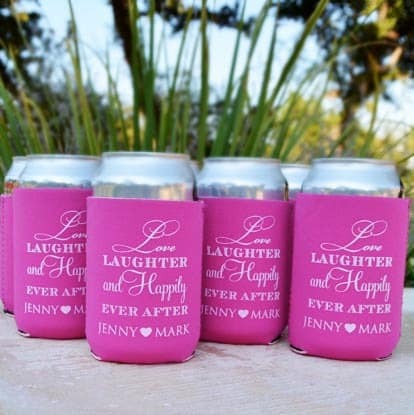 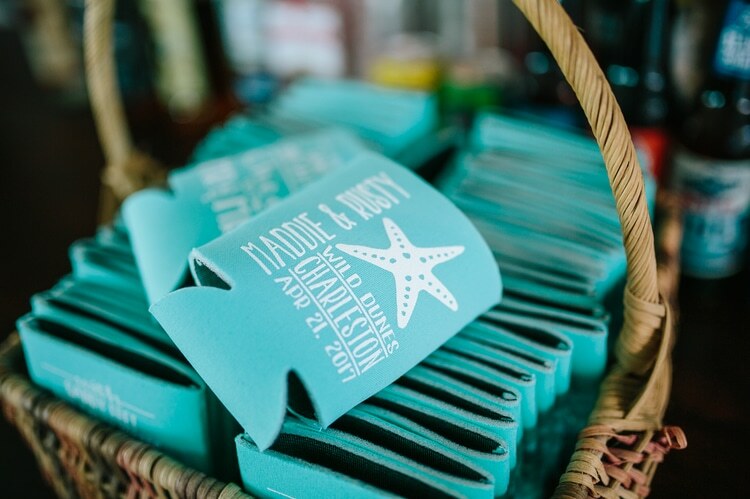 Koozies are such a popular destination wedding favor that you can now find them in a ton of colors and styles to match your wedding theme. 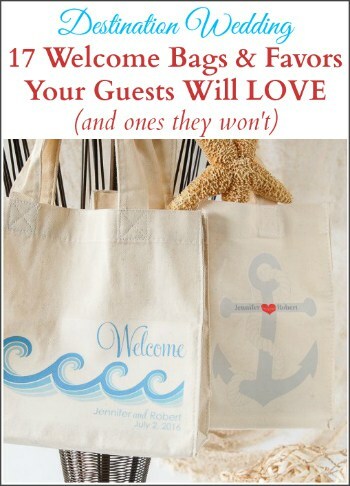 Anything that your guests will intuitively pack for their trip, or that the resort provides is going to be a waste of your time and money. 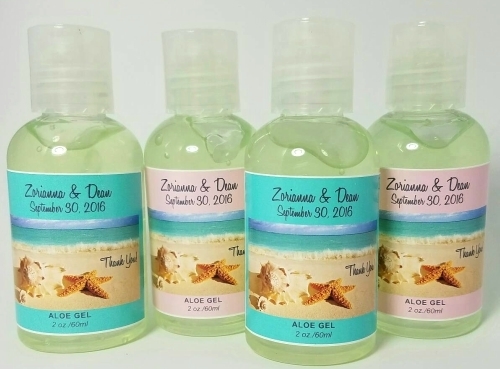 You also have to keep in mind that some people are picky about the brand they use on their skin/hair. 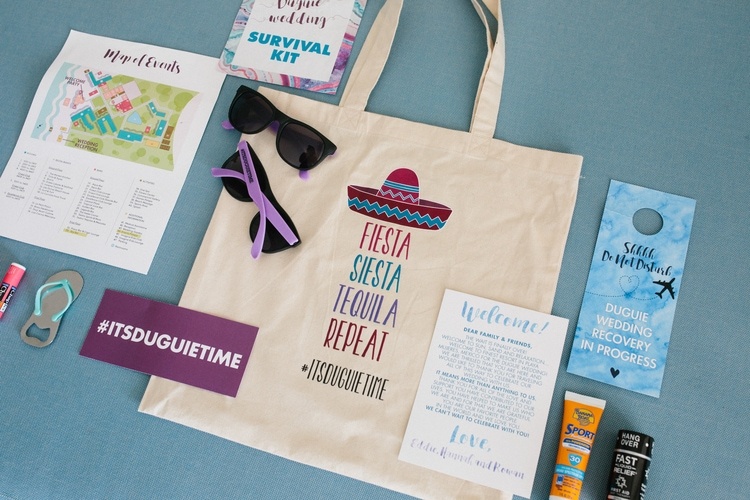 Here are some items that you’ll probably be better off leaving out of your welcome bags. 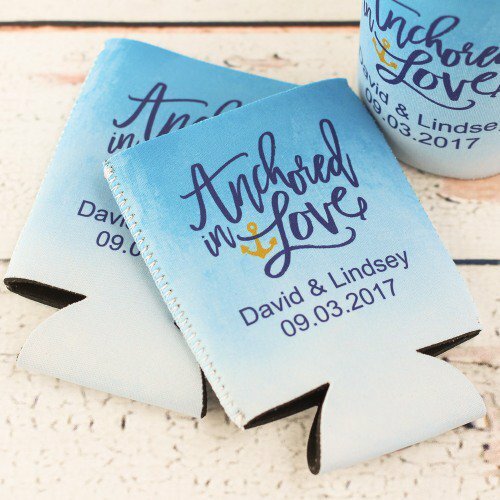 You also have to keep in mind borders & custom regulations when bringing products into the country where you’re getting married. 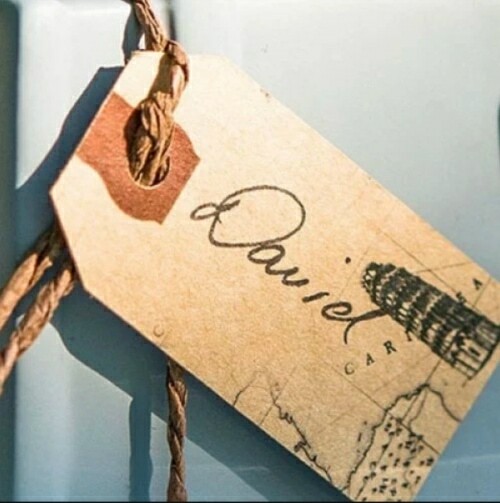 Read more on traveling with favors and how to avoid run-ins with Immigration and Customs patrol. 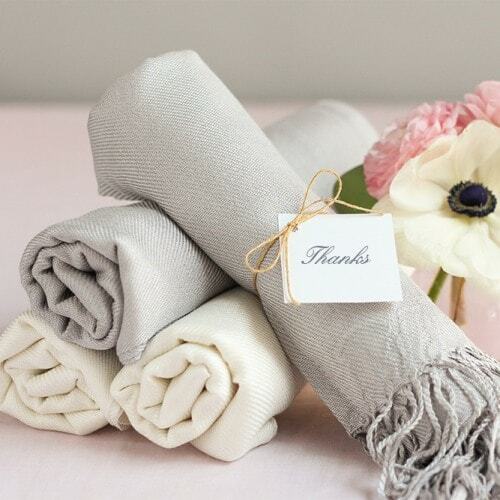 Turkish pestemal towels are great as wedding gifts. 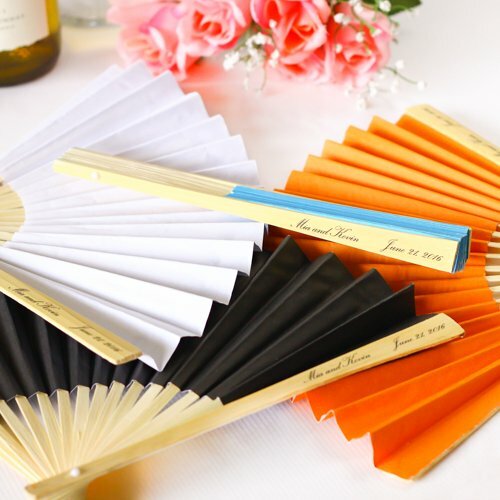 People love them.